Boston Committee of Correspondence, By Direction of the Committee of Correspondence for the Town of Boston. 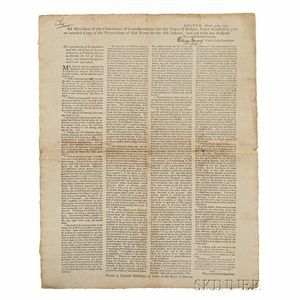 [Boston]: Printed by Isaiah Thomas, by Order of the Town of Boston, 1773. 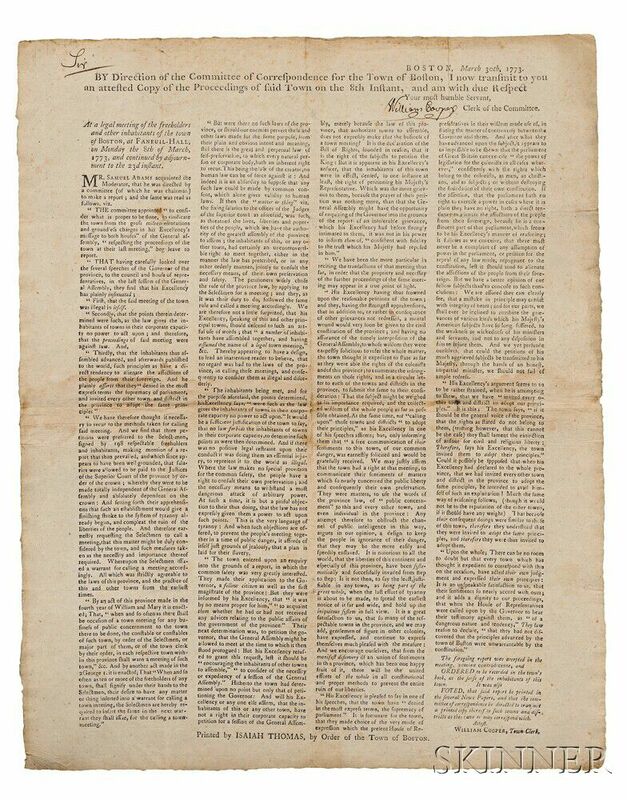 First and only edition, large format folio broadside, on a full sheet of laid paper, with a visible but difficult to discern watermark, and the counter-mark: LVC on the other half, text printed in four columns, signed at the top by William Cooper, Town Clerk, with the greeting, "Sir" added in manuscript in what looks like Cooper's hand, old folds, the sheet toned, large margins, slight loss of one letter where folds intersect, 16 1/4 x 13 in. Anti-British sentiment was heating up at Faneuil Hall in March of 1773. 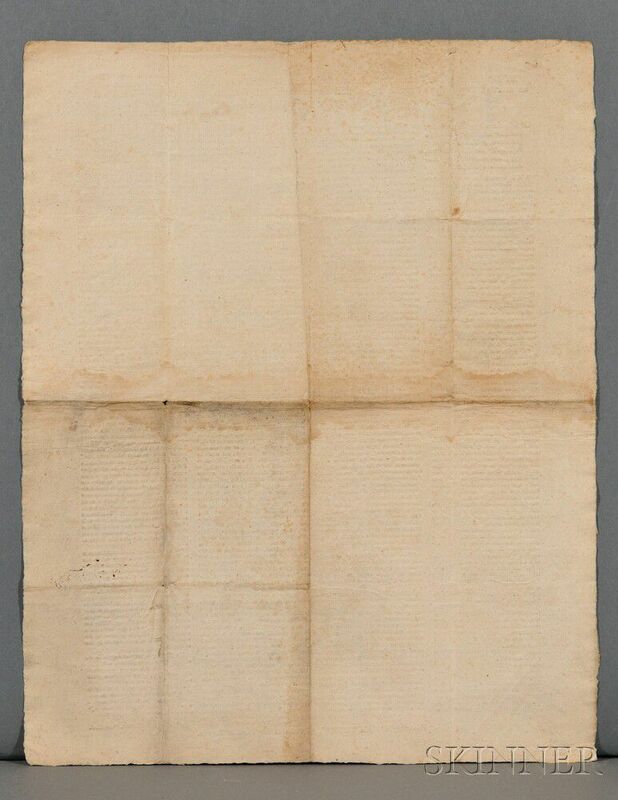 At the meeting described in this broadside, Samuel Adams (1722-1803) reports that the Governor Thomas Hutchinson (1711-1780) declared to the General Assembly, "that the [last] meeting of the town was illegal in itself; that the town meeting representatives have no power to act upon any thing resolved at such a meeting, and that therefore the proceedings of the meeting were against the law; and that the principles advanced at the meeting "have a direct tendency to alienate the affections of the people from their sovereign." Benjamin Franklin also refers to this series of events in his correspondence. In a letter to his son William, written from London on 6 April 1773, he says, "The Parliament is like to sit till the end of June, as Mr. [Samuel] Cooper tells me. I had thoughts of returning home about that time. The Boston Assembly's answer to the governor's speech, which I have just received, may possibly produce something here to occasion my longer stay."